The Lake Country Museum holds a large collection of interesting and unique artifacts. Over the next few months we will pose challenges to the community in ‘Guess the Artifact!’ with a distinctive object chosen for each week on our Facebook page and our Blog. Artifact #1 -- Do you know what this is? A correct answer should include both the name of the artifact and its primary purpose. It will then be published on our Facebook page along with the winner’s name. The winner will then receive a copy of The Spirit of Lake Country, an in-house publication written by several local residents and historians. The mystery object this week is a favorite among the Museum staff and volunteers. You can find it in the Nellie Carter Room amongst the tools on exhibit. My guess for Artifact #1 is that it is an Asian musical instrument. I think that this tool is a hide scraper. A comb. I am unsure if it is for combing hair or a mane or possibly for combing wool before it is spun. Is it a few different sizes of a similar item overlapping or is it broken? It looks somewhat like the teeth that can be removed and sharpened in a sheep shearer’s electric shearing machine. A ‘hide scraper’ might also be a possibility, as Harold suggested. Thanks for your thoughts on this, Joyce. This item is not broken; there are different sizes of a similar item in what seems to be a case. I think that this artifact is part of a cotton gin (a machine that separates the seeds, hulls and foreign materials from cotton). 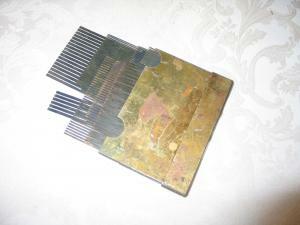 This could be a REED (which resembles a comb). On a loom, with each picking operation the reed presses each filling yarn against the portion of the woven fabric that has already been formed. This could be used for carding wool. 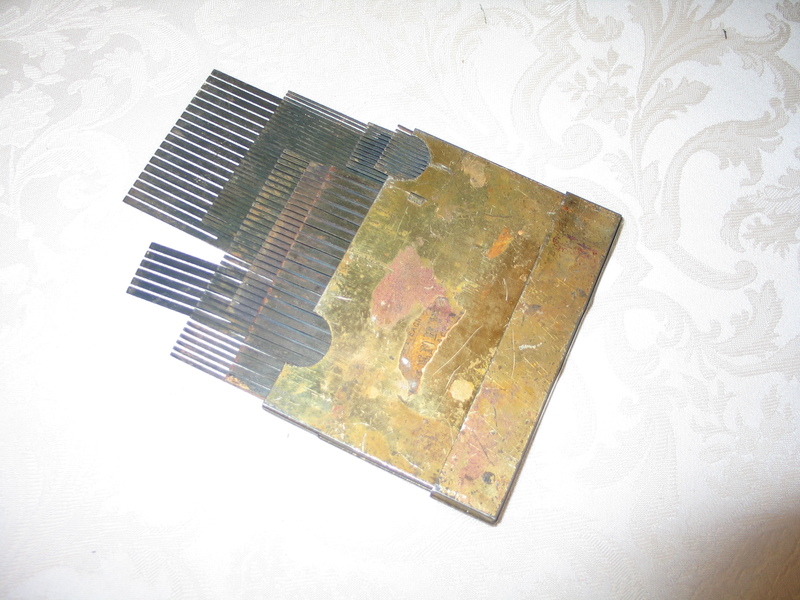 This is some type of comb used for grooming animals. Those are brass or steel accordion reeds. They are used inside the baffles of an accordion, sound is produced when they vibrate from air being forced pass them. I think Geoff is likely correct. They look like harmonica reeds to me but larger.